Theoretical Nuclear Physics, Astrophysics, and foundations of Quantum Theory and Quantum Information/Computation. 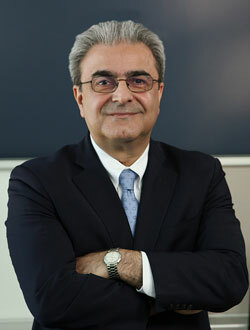 Dr. Ali Eskandarian, a theoretical physicist, is the former dean of the GW Virginia Science & Technology Campus and College of Professional Studies. Dean Eskandarian began his career at GW in 2002 as an associate dean and one of the founding members of the team that launched GW’s College of Professional Studies (CPS). Thereafter, he served as the senior associate dean for strategic initiatives and research at CPS where he led the design and development of several innovative certificates and master’s degree programs. In addition to his role as dean, he also holds faculty appointments as professor at CPS and in the Department of Physics. He combines solid grounding in academics with significant administrative and entrepreneurial experience. Since taking on the role as dean at the VSTC, Dr. Eskandarian has become actively engaged with key community stakeholders in Loudoun County, as well as those throughout the Commonwealth of Virginia. He actively participates with the Council of Independent Colleges in Virginia and is expanding partnerships with Virginia’s Community College System. He serves on the Loudoun CEO Cabinet. He has also served on the Loudoun Chamber Board of Directors and has been the co-chair of the Northern Virginia Technology Council's committee on Big Data and Data Analytics. Prior to his arrival at GW, Eskandarian worked at James Madison University (JMU), the National Research Council, as well as holding a number of positions in private industry. At JMU he held the Distinguished Oliver Professorship in the Integrated Science & Technology and Computer Science Departments, where he also held the title of Virginia Eminent Scholar. In the mid-1990s, Dr. Eskandarian was the Study Director for the “Reusable Launch Vehicles: Technology Development and Test Program” study at the National Research Council, which led to important recommendations regarding the future technological options and the nation’s space policy. He subsequently served as an advisor to the Army Research Laboratory’s Technology Assessment Board. Earlier in the 1990s, Dr. Eskandarian joined the aerospace industry and worked on the scientific satellites developed at NASA’s Goddard Space Flight Center for several space missions. Dr. Eskandarian’s current research interests at GW are focused on the foundations of quantum theory, quantum computing/information, and astrophysics. He has been a founding member of groups in quantum computing and astrophysics, and currently serves as co–director of the Center for Quantum Computing, Information, Logic, and Topology. Dr. Eskandarian holds a B.S. in Physics and a Ph.D. in theoretical nuclear physics, both from GW.